Below is an excerpt from Jane Hart’s blog post: Modernising the L&D function: From learning gatekeeper to learning concierge. Love her concept of a learning concierge someone who facilitates other’s self-organized learning (for those not yet able to do this for themselves). I’ve already talked about how helping to build new personal and social skills to work and learn effectively in a networked world will be a vital new area of work for T&D, but there is another new opportunity that I haven’t yet mentioned – and one that bridges the gap between directed learning (training/e-learning/blended learning, etc) and self-directed/self-organsed/self-managed learning; a service that is aimed at supporting the large number of people who are not yet proficient at organising their own learning. Enter the Learning Concierge service. A guest is looking to do some city sightseeing. She could simply go out exploring herself or first do some research on what to see, but if she wants some advice, she will might talk to the hotel concierge. 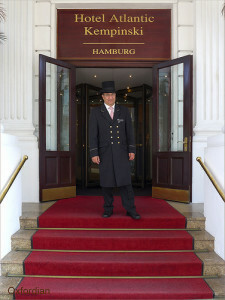 In order to provide the best help to the guest, the concierge needs to understand what she is interested in visiting, how long she has got, and if she prefers to visit the sites herself or have a guide, and depending on her answer (and her budget) he might simply mark up some major sites on a city map, recommend a walking route, a hire care service, or even a tour bus or personal tour guide. In other words the concierge makes sure he makes recommendations that work for her. A worker has identified a problem with her presentation skills in client meetings, so calls on the learning concierge service for some advice. In order to provide the best help, the learning concierge needs to understand exactly where the problem actually lies. He will also need to know if the individual would like to work on the problem by herself or with help and support from others, and then depending on her answers (and what funding she has), he might recommend some resources and articles, or suggest a presentation coach or mentor, or that she takes a masterclass or an online course. In other words the learning concierge makes sure he makes recommendations that work for her. Compare this with the normal approach that T&D would take to dealing with this same problem – that is simply pointing the individual towards the online course on Presentation Skills hosted in the LMS library. So, a Learning Concierge service operates very differently to the traditional T&D approach. Here are some further features of a Learning Concierge service which demonstrate this. It is a PULL SERVICE – so people can chose to use it. Individuals are not obliged to use it if they are happy to organise their own learning – unlike most T&D initiatives which are PUSHED down to workers, who have no choice whether to use them or not. It is a PERSONAL service that recommends options that are TAILORED to the needs, preferences, time and budget of the individual(s) concerned – it does not apply a one-size-fits-all solution. It uses a PERFORMANCE CONSULTING approach to identify the core problem and recommend a range of possible solutions – it does not assume that training is the only solution to the problem. The service is INDEPENDENT of vendors and platforms – and particularly values the wide range of free or low-cost opportunities available on the open Web that are mostly overlooked by traditional training departments. The service is STAFFED by experienced learning and performance practitioners with wide expertise in performance consulting who understand the huge range of opportunities afforded by both formal and informal learning, social and networked learning, performance support, as well as collaborative team working. They are therefore able to save an individual hours of web search time as they have answers at their fingertips. The service responds QUICKLY to requests for help, as it recognise that people often need rapid support for performance problems – and can’t wait for weeks to be booked onto external courses or workshops. The services DOES NOT MANAGE or TRACK the activity that is chosen or undertaken by the individual(s) – instead it sees it as the managers’ responsibility to review the performance improvements and changes in the individual. It does however request feedback from the individuals concerned in order to refine the service to them in the future. The service is EVALUATED in terms of the quality of the service it provides – rather than on the number of people booked on courses or who have completed courses. We give what we can, when we can. A very simple story.